Order in next 3 hours and 50 minutes for despatch today. 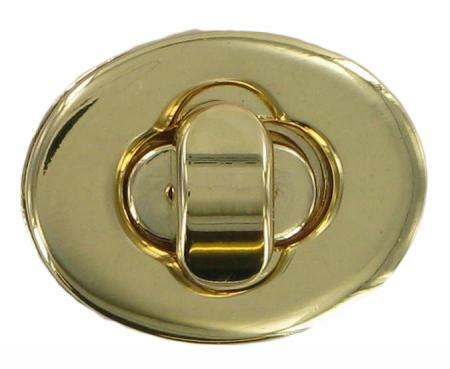 Small Oval Gold Finish Turn Lock for handbags. This small oval replacement turn lock is used on some flap over handbags. It is gold coloured. Supplied with backplate. Female section is attached with 2 grub screws (supplied) and the male section, via 2 malleable spikes. Dimensions of female section are 29mm x 23mm. Dimensions of male section are 14mm x 11mm x 19mm high (excluding spikes).